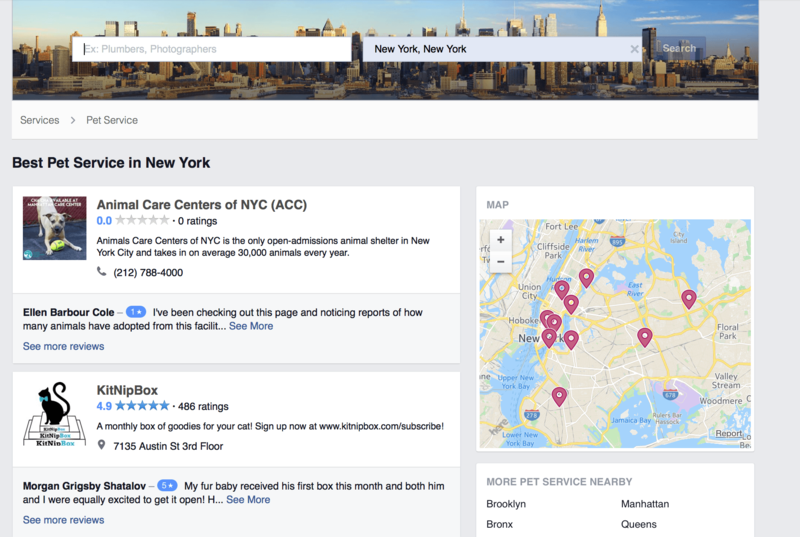 Facebook has quietly started to provide local business listings courtesy of a new site it just launched. The feature, which claims to helps users “find local businesses with the best Facebook reviews and ratings,” acts as a search engine that displays local services (painters, plumbers, electricians) currently listed on the social network along with its user reviews. Additional information includes a tally of the number of reviews for each listing, phone numbers, address, opening hours, and a short description. The feature is presently only available on desktop. The move, spotted by tech blog Search Engine Land, sees Facebook muscling in on territory currently home to popular online listings providers such as Yelp and Angie’s List — and its impact is already being felt. Since news of the new feature broke, Yelp’s shares fell around 9% to $26.87, reports USA Today. Angie’s List has suffered a similar fate (albeit on a smaller scale) with its shares dropping 2% to $9.24. The market depicts what is likely to be a worrisome outlook for online listings providers now that Facebook is on the scene. With 1.4 billion users and 40 million small business pages, the social network will be a force to contend with. “We’re in the early stages of testing a way for people to easily find more Pages for the services they’re interested in,” Facebook spokesman Mike Manning said in an emailed statement to USA Today. Facebook has increasingly courted small businesses of late, launching more plugins and e-commerce features aimed squarely at local service providers. Angie’s List estimated the local services industry to be worth $800 billion this year, according to the Wall Street Journal. And with so many small businesses looking to boost their presence on the social platform, the new listings site is a seemingly natural progression in Facebook’s business strategy.